Proposal 42. 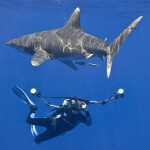 Colombia, Brazil and the USA proposed the Oceanic whitetip shark, Carcharhinus longimanus, for Appendix II. The species has suffered drastic declines. Populations of oceanic whitetip sharks have declined by >99% in the Gulf of Mexico, and 60% to 70% in the northwest and central Pacific Ocean. Threats to the species are bycatch in pelagic longline and driftnet fisheries for swordfish and tuna, and the unsustainable harvest for the international fin trade. Their fins are easily identifiable and one of the most common shark fins in trade. The species clearly meets the criteria for listing on Appendix II.